Carcinoma pancreas is a common malignant disorder of the digestive system. Unfortunately, most cases of pancreatic cancer often present late and are not amenable to surgical cure. Approximately 40% of patients have metastatic disease at the time of presentation. Common metastatic sites include liver, peritoneum, and lung. However, central nervous system metastases are rarely seen in carcinoma pancreas, and most reported cases show lesions in the brain parenchyma. Carcinoma pancreas with meningeal metastasis is an extremely rare presentation, and fewer than 10 cases have been reported in literature. Meningeal infiltration by solid tumors has been reported in 3%–8% of cases. Clinical presentation is similar to meningitis or brain tumors and includes dizziness, nausea, vomiting, neck rigidity, and sensory and motor deficits. Treatment of meningeal metastasis consists of palliative chemotherapy and radiation. The meningeal carcinomatosis has a poor prognosis with median survival of 8–10 weeks. Here, we present a case of carcinoma pancreas with meningeal metastasis, presenting as meningitis. In view of poor general condition of the patient, the Eastern Cooperative Oncology Group score of 4, and after multidisciplinary discussion, only palliative treatment was given. She rapidly deteriorated and succumbed to her illness, 5 days after admission to our hospital. Pancreatic adenocarcinoma is the fourth most common cause of cancer death worldwide. It is a highly aggressive tumor, and only 20% of cases present with localized tumor which is surgically resectable. Among rest, 40% of patients present with locally advanced and remaining 40% of patients have metastatic disease at the time of diagnosis. The most common site of metastasis for the carcinoma pancreas is liver and peritoneum followed by lungs. Skeletal metastasis has been observed in 5%–20% of cases. Nervous system involvement is rare in pancreatic carcinoma, and central nervous system (CNS) metastasis is reported in very few cases. Isolated meningeal infiltration without any parenchymal lesion in the brain is even rarer. Our patient was a 69-year-old female, who presented with a history of pain abdomen and recurrent nonbilious vomiting for 10 days. The patient was not tolerating even liquid by mouth at the time of admission. She also had a history of altered sensorium for 2 days. She had no other comorbidity. On examination, she had fever and epigastric fullness. Neurological examination found slurring of speech and neck rigidity. Her contrast-enhanced computed tomography abdomen revealed a heterogeneous mass lesion in the body of pancreas with central necrosis suggestive of carcinoma pancreas. It measured approximately 7.2 cm × 6 cm × 3.7 cm in size and was extending into the lesser sac with regional lymphadenopathy [Figure 1]. Her carbohydrate antigen 19-9 level was 1953 IU/mL, and liver function tests showed evidence of cholestasis. 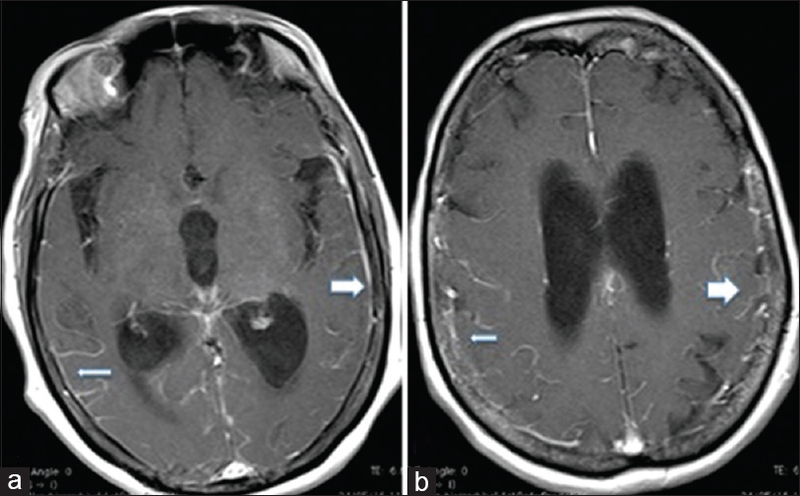 Magnetic resonance imaging (MRI) brain was done in view of neurological abnormalities, which showed moderate dilation of the ventricular system with periventricular enhancement [Figure 2], and suspicion of meningitis was made. Lumbar puncture was done for cerebrospinal fluid (CSF) analysis. 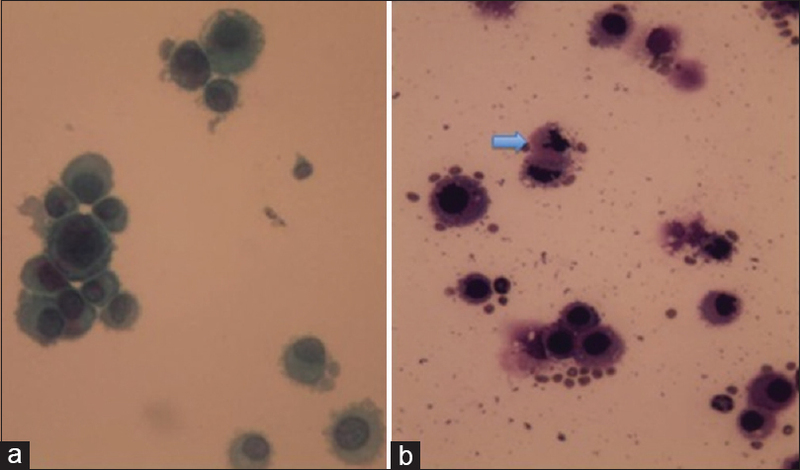 CSF cytology was consistent with metastatic adenocarcinoma [Figure 3]. In view of her poor general condition with the Eastern Cooperative Oncology Group 4 and after multidisciplinary discussion, only palliative treatment was planned. Relatives of the patient were informed about poor prognosis and advised to shift the patient to a hospice setting, but they refused to go elsewhere. After diagnosis, the patient rapidly deteriorated and succumbed to her illness, 5 days after admission to our hospital. Meningeal carcinomatosis was first described by Eberth in 1870. Leptomeningeal carcinomatosis (LC) generally manifests in advanced stage in a known case of metastatic tumor. Previously, LC was considered an uncommon presentation, but incidence is increasing due to improved survival rate of cancer patients and imaging techniques. Incidence of 5%–8% is reported in various cancer patients and up to 20% at autopsy in patients with neurological symptoms. Most common primary associated with LC is hematological cancers such as leukemia and lymphoma. Although some solid tumors such as lung cancer and breast cancer are prone to develop LC, tumors of the gastrointestinal system including pancreas rarely cause meningeal metastasis. Jacobs and Richland in 1951 and Little et al. in 1974 reported several cases of LC diagnosed at autopsy in a patient with pancreatic cancer. After that, only few cases of meningeal metastases were reported in patients with pancreatic cancer. Malignant cells may spread to the meninges through various mechanisms. Hematological cancer spread by hematogenous route, while solid tumors generally spread through perineural or lymphatic route. Tumors located within the brain parenchyma may directly infiltrate the meninges either spontaneous or during a neurosurgical procedure. Direct invasion of leptomeninges by tumor is highly unlike without the involvement of adjacent brain parenchyma. Once tumor cells invade the meninges, rapid spread occurs through CSF and multiple tumor deposit occurs throughout the meninges. Pancreatic carcinoma is known to spread perineurally into the retroperitoneum, so perineural spread may be consider as the mechanism behind meningeal invasion. Meningeal carcinomatosis presents with nonspecific symptoms such as headache, nausea and vomiting, altered sensorium, or signs of meningeal irritation as neck rigidity. Ventricular system involvement leads to hydrocephalus and CSF diversion may be considered in palliative treatment. Cerebral involvement may manifest as encephalopathy seizures or other signs of focal neurological deficit. Meningeal carcinomatosis can primarily present with localized signs due to cranial nerve infiltration or spinal cord involvement. The meningeal carcinomatosis is difficult to diagnose, and a high index of suspicion is required based on history and clinical signs. The definitive diagnosis of meningeal carcinomatosis can be made only with CSF cytology. However, sensitivity of a single lumbar puncture is reported to be 50%–70% but improves up to 90% with repeated procedure. MRI showed better sensitivity (76%–87%) than single CSF cytology. MRI brain reveals finding consistent with meningitis such as diffuse meningeal enhancement along with multiple nodular deposits in the subarachnoid space or cortical surfaces and ventricular enlargement. CSF analysis shows elevated pressure, increase protein, and decrease sugar levels. Tumor markers if present in CSF can help in diagnosis. CSF analysis may detect some cases with no finding on MRI or vice versa, so they can use as complementary to increase the diagnostic accuracy. There is no standardized treatment for meningeal carcinomatosis of carcinoma pancreas. However, meningeal carcinomatosis in common has poor prognosis with survival not more than 4–6 weeks without treatment and 3 months with treatment. Treatment is mainly palliative and based upon performance status. Poor-risk patients are given only supportive treatment, while good-risk patient may be considered for other treatment to improve quality of life. Chemotherapy is suggested for chemosensitive tumors such as small-cell lung carcinoma and lymphoma. Intrathecal chemotherapy with methotrexate, thiotepa, and liposomal cytarabine is an option, but no benefit is seen compared to systemic therapy in randomized controlled trials. External beam radiotherapy has been used to stabilize neurological symptoms with a dose of 30 Gy in 10 fractions and may provide relief from pain. The only surgical indication in these patients is the development of hydrocephalus, which may require a ventriculoperitoneal shunt. Pancreatic carcinoma is a common malignant disorder. CNS metastasis of pancreatic carcinoma is very rare and very difficult to diagnose due to nonspecific symptoms. However, one should consider CNS metastasis in carcinoma pancreas patients with recent development of neurological symptoms. Timely diagnosis of patients may exempt from unnecessary surgical procedure, which may even impair the quality of life without any benefit in terms of survival. Deeb LS, Yamout BI, Shamseddine AI, Shabb NS, Uthman SM. Meningeal carcinomatosis as the presenting manifestation of gastric adenocarcinoma. Am J Gastroenterol 1997;92:329-31. Filho AF, Cardoso F, Di Leo A, Awada A, da Silva VD, Tovar RB, et al. Carcinomatous meningitis as a clinical manifestation of pancreatic carcinoma. Ann Oncol 2001;12:1757-9. Mirrakhimov AE, Khan FN. Epidural brain metastases in a patient with early onset pancreatic cancer: A case report and literature review. Case Rep Oncol Med 2012;2012:962305. Wolfgang G, Marcus D, Ulrike S. LC: Clinical syndrome in different primaries. J Neurooncol 1998;38:103-10. Gil Z, Cavel O, Kelly K, Brader P, Rein A, Gao SP, et al. Paracrine regulation of pancreatic cancer cell invasion by peripheral nerves. J Natl Cancer Inst 2010;102:107-18. Wasserstrom WR, Glass JP, Posner JB. Diagnosis and treatment of leptomeningeal metastases from solid tumors: Experience with 90 patients. Cancer 1982;49:759-72. Drappatz J, Batchelor T. Leptomeningeal metastasis. In: American Society of Clinical Oncology Educational Book. Alexandria, VA: American Society of Clinical Ongolocy; 2009. p 100-5. Leal T, Chang JE, Mehta M, Robins HI. Leptomeningeal metastasis: Challenges in diagnosis and treatment. Curr Cancer Ther Rev 2011;7:319-27. Mehta M, Bradley K. Radiation therapy for leptomeningeal cancer. Cancer Treat Res 2005;125:147-58. Chamberlain MC, Glantz M. Ventriculoperitoneal shunt in patients with leptomeningeal metastasis. Neurology 2006;66:783.